Marty Pevey will return for his third season as the Iowa Cubs manager as the Chicago Cubs announced their 2015 minor league staffs and coordinators Wednesday. Hitting coach Brian Harper, athletic trainer Scott Barringer, strength and conditioning coach Ryan Clausen, and video coordinator Walker McKinven also return to Pevey's staff. Pitching coach Mike Cather and assistant hitting coach Leo Perez will be new to Iowa's staff in 2015. Pevey becomes the fourth manager in Iowa Cubs history, and the sixth manager in franchise history, to spend at least three seasons with the team. Joe Sparks (managed the Iowa Oaks from 1973-75 and '77-'79) and Mike Quade (managed the Iowa Cubs from 2003-06) are the managers with the longest tenures in Des Moines. The Cubs are 140-148 under Pevey the last two seasons. Last year, the club posted its first winning record since 2010, finishing 74-70 and just 2 1/2 games behind the Omaha Storm Chasers in the Pacific Coast League's American Northern Division. This is Pevey's seventh year in the Cubs' organization and his fourth as a manager. He managed the Class A Peoria Chiefs in the Midwest League in 2009 and was the organization's catching coordinator from 2010-12. The 2015 season will be Pevey's 32nd in professional baseball and his 13th as a manager, posting a 784-765 (.506) career record as a skipper. He has won his league's Manager of the Year Award four times. Pevey has also coached in the big leagues with the Toronto Blue Jays as their bullpen coach (1999), first base coach (2006) and third base coach (2007-08). He spent time assisting the Chicago Cubs staff in September each of the last two seasons. As a player, Pevey was drafted by the Minnesota Twins in the 19th round of the 1982 Draft out of Georgia Southern University. He played 13 seasons, including nine at Triple-A. He made his Major League debut with the Montreal Expos on May 16, 1989 and played 13 games in his only big league season. Harper also returns for his third season with Iowa and his fifth in the Cubs' organization. He managed at Class A Advanced Daytona in 2012 and Double-A Tennessee in 2011. 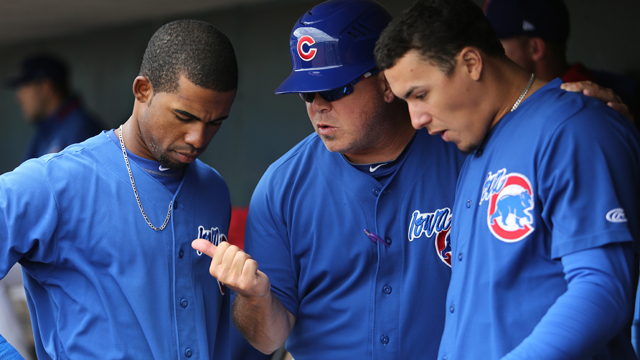 He has also represented the Cubs as the hitting coach with the Mesa Solar Sox in the Arizona Fall League in 2012-13. Prior to joining the Cubs, Harper managed in the Los Angeles Angels' system from 2001-07, including two years in the PCL at Salt Lake from 2006-07. From 2008-09, he was the San Francisco Giants' roving catching instructor and he managed their Class A Advanced team in San Jose in 2010. Harper played 16 big league seasons with the Angels (1979, '81), Pittsburgh Pirates ('82-84), St. Louis Cardinals ('85), Detroit Tigers ('86), Oakland A's (1987, '95), Minnesota Twins ('88-93), and Milwaukee Brewers ('94). He played in the World Series with the Cardinals in '85 and the Twins in '91. This will be Cather's 10th season in professional coaching, but his first with the Cubs. He spent the last three seasons in the San Diego Padres organization and was their pitching coach at Triple-A El Paso last year. He served as the Padres' Minor League pitching coordinator from 2012-13. Prior to the Padres, Cather worked six seasons (2006-11) in the Boston Red Sox organization. He was the pitching coach for Class A Advanced Wilmington (2006) and Double-A Portland (2007-09) before switching roles to Major League scout in 2010. Cather was drafted by the Texas Rangers in the 41st round of the 1993 Draft out of the University of California. He pitched professionally for the Rangers (1993-95), Atlanta Braves (1996-99), Florida Marlins (2000), and Cardinals (2001). He made 75 career big league relief appearances in the regular season for the Braves from 1997-99 and was 5-6 with a 3.42 ERA (31ER/81.2IP) and also made five postseason appearances in 1997. Perez begins his seventh season as a coach in the Cubs' organization after playing in the team's Minor League system from 2003-08. He was a catcher in 2003-04 and 2008, reaching Class A Advanced his final season. He also pitched in rookie ball one season in 2006. Perez is a native of the Dominican Republic and was an assistant coach last year at Tennessee. Barringer begins his third year in the Cubs' organization. He was the athletic trainer at Double-A Tennessee in 2013. Prior to joining the Cubs, he was with the Arizona Diamondbacks' organization at Rookie-level Missoula (2011) and Class A Advanced Visalia (2012). Barringer graduated in 2009 from East Stroudsburg (Pennsylvania) University with a Bachelor's Degree in Athletic Training and earned a Master's of Science in Athletic Training from East Carolina University in 2011. Barringer hails from Doylestown, Pennsylvania. Former Iowa Pitching Coach Mike Mason (2008-13) will begin his second season as the Cubs' assistant pitching coordinator and former Iowa Athletic Trainer Nick Frangella (2012-13) remains the organization's head Minor League athletic training and performance coordinator. Former Iowa hitting coach Dave Keller (2012) managed at Daytona the last two seasons but has been promoted to be the Cubs' Minor League Latin America field coordinator. Former Iowa manager Buddy Bailey (2007) will be back as the skipper at Double-A Tennessee for the fourth straight year along with former Iowa hitting coach Desi Wilson (2009). Former Iowa catcher Mark Johnson (2005, '09-10) was promoted to manage Class A Advanced Myrtle Beach after managing the last two seasons at Class A Kane County. Baseball America named Johnson the Minor League Manager of the Year after leading the Cougars to a 91-49 record and a Midwest League title last year. Former Iowa outfielder Carmelo Martinez (1983) will be the manager at Rookie-level Mesa and former I-Cubs outfielder Ty Wright (2010-13) will be a first-time coach on his staff. The I-Cubs open the 2015 season on Thursday, April 9 at Memphis and the home opener at Principal Park will be on Friday, April 17 at 7:05 PM against the Oklahoma City Dodgers. Season ticket and mini-plans are available. For more details, fans can check out iowacubs.com or call (515) 243-6111.